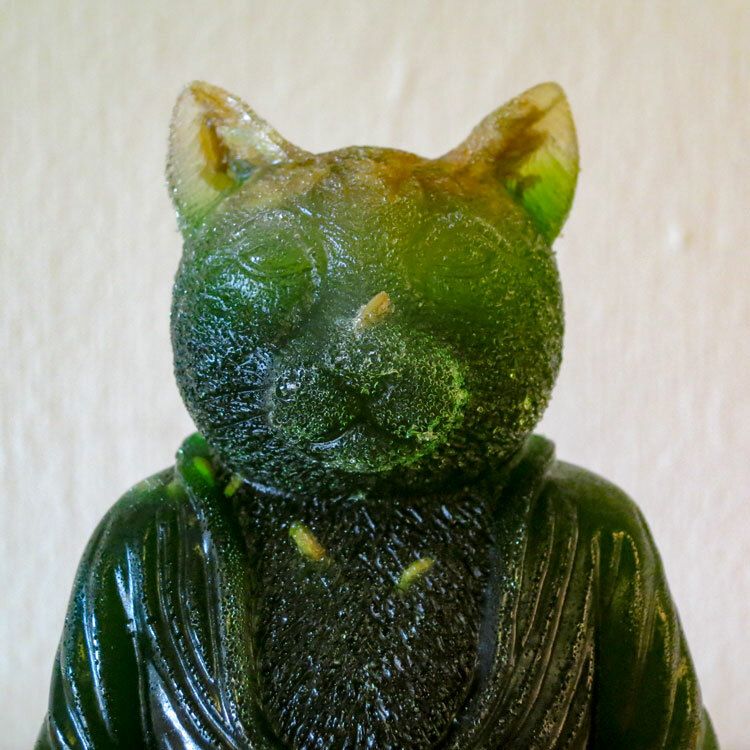 This recipe will make 1 standard Fennel Gummi Cat Buddha, measuring 4" at base diameter and 5" in height. Use a food grade silicone such as FGS-2237, manufactured and sold by Douglas & Sturgess. If you can't get your hands on fennel extract (also known as fennel tincture), try making your own. 1. Chop your fennel bulb into 1/2" pieces. Boil 3 cups of water in a sauce pan. Add the chopped fennel to the sauce pan, cover and boil for 10 minutes. This will add some mild natural color and sweetness. If you like, substitute a couple tea bags for the fennel bulb. This will give you a dark, rich and flavorful gummi. 2. Empty your fennel seeds into 2 cups of cold water - they will become little flavor blasts in the finished gummi. I use my 1 quart measuring cup for this step. Sprinkle in the gelatine evenly and slowly while stirring with a spatula to avoid dry clumps. Once the mixture has the consistency of thick applesauce, cover and set aside for 10-15 minutes. 3. Reduce your boiling fennel water to low heat. Spoon out and discard the boiled fennel. Keep 1 cup of the boiled fennel water in the sauce pan. It should have a faint green coloration. Add your confectioners sugar and dissolve on low heat, stirring occasionally for about 2 minutes. 4. Scoop the gelatine and fennel seed mixture into the sauce pan. The mixture will have thickened somewhat and may tend to slide out in a solid chunk - watch out for splash back! Continue to stir over low heat for 5 minutes as the gelatine dissolves. Once dissolved, scrape the sides and bottom of the sauce pan with your spatula and make sure everything is stirred together. Turn off and let sit for 2 minutes. 1. Slowly pour your gelatine mixture into your mold or baking sheet. 2. Using your finger or a spoon, remove any bubbles from the surface. Let the mold sit for 2 minutes. 3. Add 60-120 drops of fennel extract, to your taste. A thin layer of gelatine may have solidified on the surface. If so, remove it with your finger or a spoon before adding the extract. - As a recommended option, add drops of food coloring intermittently with the fennel extract. I suggest no more than 5 drops. 4. Refrigerate your mold for 4 hours.